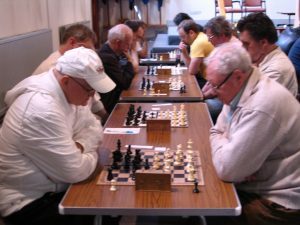 Dave (left) in action at the Brighouse Rapidplay in 2011. He was never seen without his trade mark baseball cap. Unfortunately we must begin 2018 by sharing the sad news that Dave Milton passed away in December. So many Calderdale Chess players will have met him or known him and a very great number of us enjoyed playing against him. Tributes to and memories of Dave have already been shared by Ihor Lewyk on the Yorkshire Chess website and a detailed obituary recalling his involvement in Yorkshire Chess has also been published by Steve Mann on his Yorkshire Chess Association Yearbook. I don’t intend to repeat any of the content from those two articles and Ihor and Steve both knew Dave and his long term involvement with chess much more intimately than I. What is absolutely clear from those two articles and from the conversations and emails I’ve had about Dave in the last few weeks is his huge enthusiasm and appetite for the game, not only as a player but primarily as an organiser and team Captain. I first met Dave when I moved to Calderdale twelve years ago at which time he was Captain of the Calderdale ‘B’ team in the Yorkshire League. He gave me the opportunity to play my first games for Calderdale. However, most local league players will have known Dave for his leadership of the Todmorden Chess club which, quite simply, wouldn’t have existed without him. Dig back into the Yorkshire Chess Annual Statistics web page and you’ll notice that, in 2007-08 Todmorden Chess Club disappeared from the records. It was Dave who re-established them in 2009-10 and he essentially ran the club and organised all the teams from then until the beginning of this season when his illness forced him to give it up. Dave built up Todmorden’s player base over the years and at one point in 2012-13 they even had four teams across the two divisions. He was particularly determined to see the ‘A’ team capture the League 1 title. After a number of near misses he finally achieved this objective in 2014-15 and under his skillful stewardship the team then went on to make up for lost time by retaining their title in 2015-16 and again last season. Unfortunately the club was so reliant on Dave that when he stood down last summer it almost folded. However, the team now called Golden Lion was salvaged and will be playing the remainder of this season’s fixtures with his legacy very clearly in their thoughts. Indeed, the team heard the news of his passing last month just a week before they played league leaders Huddersfield ‘A’ and certainly felt that their win in that match was a fitting tribute to him. It’s hard to think of Dave as either a team Captain or a player without reflecting on his long battle with a rare form of cancer called myeloma which effects the blood’s plasma cells and is a relapsing-remitting form of cancer. Dave lived longer with this condition than anyone else in the UK and his chess play was as implacable, unyielding and resilient as his battle with this illness. I had a few hard battles with him myself in recent years and will remember him as a friendly and sporting, but tough opponent. Dave was heavily involved with the organisation of the Caldedale League, in recent years it was he who ensured all the various trophies were engraved and returned from incumbent champions in time for presentation to their new owners at the League AGM. He played regularly in the Calderdale (for Todmorden) and Bradford (for Central Division) leagues and his last game was played for Belgrave ‘C’ against Halifax ‘C’ as recently as October. I must thank Howard Wood for generously agreeing to send me the moves of this game which Dave won. I’ve also published one of my games against him in the viewer below. Both games are typical of the style I mentioned above and both see him deploying one of his favorite openings, the French Defence. Friends and colleagues across the region will miss Dave very much and of course we send our condolences to his family. His funeral will be held at 14.15 on the 9th of January at Park Wood Crematorium, Park Road, Elland. HX5 9HZ. The family have requested no flowers be sent and that any donations instead be made to the MacMillan Cancer Support Fund Halifax. Please feel free to share your memories and thoughts about Dave by leaving a comment to this post. A very nice obituary Dave and an interesting game!